Anyone else sick of the whole 80s revival thing yet? Or was hating on it ‘So 2012’ and we’re now just fine with eternally rehashing the culture of a yesteryear that most of us weren’t old enough - or even alive - to actually appreciate? As an ‘83 kid, even I can barely remember the decade that so many people younger than me worship like it was the best years of their non-lives, and I’m pretty sure it wasn’t worth this level of lengthy tribute. But a mere mention of words like ‘VHS’, ‘Atari’ and ‘aviator glasses’ is still enough to send even today’s school kids into a tizzy, so it looks as though we still won’t be done with it for a while. Please understand that this criticism is not aimed at the decade itself - there are still a good amount of cool things which endured from that era that deserve attention. The synthwave music revival, though still very much an online-specific scene, is still proving that beepy, warbly keyboards still have a place in today’s audial landscape. The embracing of retro video games as an artistic platform has also helped given birth to an incredible indie gaming scene, with contemporary classics like Stardew Valley and Undertale. And say all you want about today’s technical movie masterpieces; one major golden age of film was indeed the era that gave us the likes of The Goonies, Poltergeist, A Nightmare on Elm Street, War Games and a whole bunch of other cult flicks. 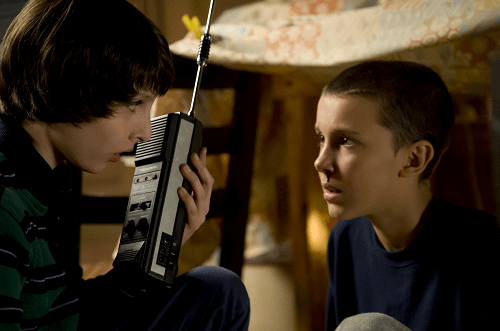 Away from all the hipster-born cruft that persists in modern pop culture, it's particularly the latter contribution that should be celebrated in what they bring to the present - because those classic movies now mean we have a show like Stranger Things. Stranger Things is an eight-episode sci-fi horror ride that feels like the unsurpassable zenith to all of this Reagan-era proliferating, in the sense that no other production attempting to portray that period could ever manage to emulate it with such thoroughness or, thankfully, understanding. This is a show that goes far beyond being a warm tribute to a fondly-remembered cultural epoch; its countless nods to its many horror and psychological film influences, its visual replication of crackled video-cassette distortion and its uncannily-derived John Carpenter-esque soundtrack give it a vibe so utterly identical to its influences that you’d be forgiven for thinking this was actually the kind of B-movie that sat undiscovered in the back aisles of your local antique video store for too long. It is a near-flawless duplication, rather than an imitation, of a time that continues to be paid homage to - but rarely gets captured so well in atmosphere. Best of all, it manages to unravel itself in such a way that, while undoubtedly a pastiche, refuses to just give into its status as an 80s horror rehash, and fall into the trap of being a lazily unloading of one pop-cultural reference after another. Hawkins, Indiana, in which Stranger Things takes place, is the typical kind of backwater that most of the shows' inspirations would easily have taken their stage. A small town of even smaller consequence, it's the kind of place where everyone knows each other, unusual events simply don't happen, and kids are free to play out well after dark. It is indeed a group of four kids that the show places a focus on - Mike, Will, Dustin and Lucas to be exact - and the four of them spend most of their free days riding their bikes out around the local wilderness, with their evenings dedicated to yet another session of playing Dungeons and Dragons with one other. November 16th, 1983 is just yet another day that this geeky foursome come together at Mike's place for another campaign of dice-rolling and spell-casting, all of course fuelled by the adventures created by their own wild imaginations. Only this time, the escapade doesn't quite go as planned. In their campaign's climactic fight with its final monster, The Demogorgon, Will fails to roll the dice score needed to cast the 'Fireball' spell that'll vanquish the foe. The game ends in unexpected anti-climax, and the gang are then made to go on their own separate ways, as Mike is then called to dinner by his mother. Morning comes with a further disturbing development still - Will failed to arrive home last night. By the evening his mother Joyce (Winona Ryder), initially assuming he came back while she was working and had just left early the next day for school, soon grows frantic with worry and demands the Hawkins police department gets a search party out. 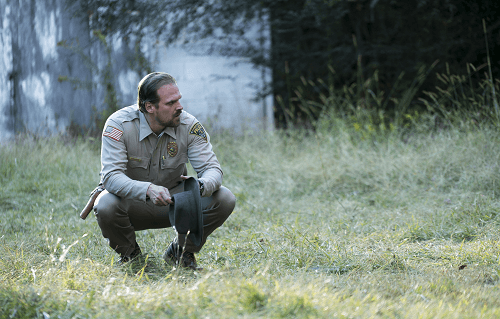 This is easier said than done - the department's chief, Jim Hopper (David Harbour), isn't particularly used to events requiring major investigation in his backyard, and he isn't necessarily fond of them arising either. Initial attempts to locate Will only dig up his bike, abandoned by the local quarry, and little other leads to explain his disappearance. Both Joyce and her eldest son Jonathan - Will's older brother - are left with little else to do but grieve his disappearance and hope something turns up. That is until that ‘something’ comes looking for them. Out of nowhere, the home phone rings, and Joyce receives a phone call from Will himself - interspersed with static and other unnerving, otherwordly noises. It's obvious that Will is alive, but where exactly he is, is still a mystery - he may no longer even be in this world at all. It's just one of the many unexplained incidents that slowly begin to emerge, creating an air of dread within this sleepy community. Days later Barbara, a friend of Mike's sister Nancy, also disappears in similarly eerie circumstances. The Hawkins Laboratory, a classified scientific research complex completely isolated to the outside world, is also dealing with its own security issues. It’s spending a lot of energy trying to cover up its own missing person problems - the first being a lab worker, last seen by the viewer desperately trying to operate an elevator to get him away from the bowels of the facility before being snatched up by a monstrous creature. Of greater concern however is that they’ve also managed to lose one of their resident test subjects: a mysterious girl with a power that has given both they and the CIA plenty of reason to keep her under wraps. The girl could only have escaped out of her confinement into the surrounding wilderness, meaning she should be an easy find - but the increasing alarm in the surrounding community around Will's disappearance has made them oddly cautious. With Will's friends also desperate to find him, it's only a matter of time before both they and the girl cross paths - and unveil a parapsychological phenomenon that has caused both his disappearance, and birthed an apparition to the world too demonic to imagine. How this unveiling slowly occurs is a testament to how the truly great shows, whatever their era, place an importance on showing their story, instead of merely telling it. Stranger Things impresses with how it masks the intricacies of its Cold War sci-fi conspiracies and its throbbing supernatural undercurrent just enough to keep a viewer desperate for a conclusion to all of the questions its builds. It does admittedly achieve this mostly by borrowing themes and imagery directly from its influences - intrepid kids involved in Something Way Bigger Than Themselves(tm) as protagonists; murderous, stalking creatures who love to lurk just off-camera and tear through house walls with long-clawed hands; the striking, off-kilter synths that are agonizingly eked out by the superb soundtrack are but a few of its re-factored ideas. But it is how it uses these items as instruments for immersion that make it stand out. So many 80s tributes lose their ability to engage, simply because they become more about self-indulgent referencing than offering actual drama. Stranger Things excels because it knows how to tie its ingredients together as a cohesive horror; simply put, it knows why and how all of its nods to older films created such chills in the first place. But there is also, at heart, a paranormal thriller here fast-paced enough and, most of the time, narratively shrewd, for it to also feel impeccably modern. It is a commendable achievement that Stranger Things feels fresh even with its old, and that it is able to often achieve such a seemedly impossible feat for much of its flow. Such qualities are especially abundant in the opening half of episodes, as the show slowly fleshes out its full cast (all of whom feel genuinely important to the plot’s progress) and popping out its early scares with an incredible level of suspense. The mystery of El, the fragile, near-mute Hawkins lab escapee who is the catalyst for most of the show's flashpoints, comes off the back of some brilliantly written flashback sequences that aren't just used to reveal her past, but also the terrifying horrors she's unwittingly unleashed. The kids she eventually befriends - Mike et al - genuinely also capture those collective, Goonie-esque characteristics of being a bunch of awkward yet uncanny suburban youngsters determined, against unsurmountable odds, of reaching an impossible goal - though in this case, it’s finding their friend, rather than an old pirate’s treasure. The early police investigations prove the adult characters are just as invested in the on-screen developments as the viewer is, and there's even some proper effort put into the inclusion of a teenage clique into the mix, who ultimately become embroiled in everything far more, and far better, than initially imagined. Where things start to become a bit sticky for the series is that all of this great work peaks too soon. So strongly delivered is the development and production of Stranger Things’ initial six episodes that the climax to the series seems strangely out of breath, much like the characters who spend their time desperately trying to evade the show’s central monster. A daft conclusion that explains both Will’s whereabouts as well as the fearsome unknown entity keeping him from returning to the real world doesn’t so much follow in the same spirit of enhancing ideas from the past, as outright copying them. The final, last-gasp attempts by the kids to try and lure the creature to them for final confrontation also feels like a scripting mish-mash cobbled together on set. 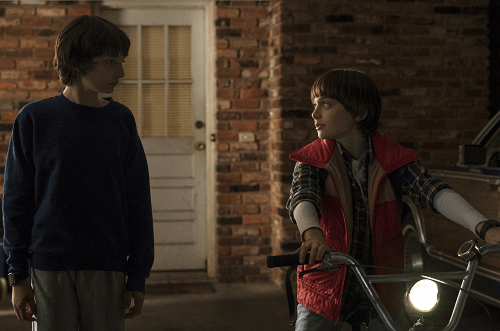 In general, there is a genuine sense of rush in the final two episodes that almost undoes all of Stranger Things’ solid, creeper-flick foundations that turns the whole affair into a farcical juggling of far-fetched ideas, before they’re thrown at a wall to see what sticks. It’s probably just as well that the show is already set for a second series, because they definitely owe the viewer a better payoff than the hurriedly abrupt final chapter they serve up to their first. Perhaps the knowledge of a follow-up season secured will help relieve some of the writing anxiety. They certainly don’t need to worry about the performance quality of the cast, many of which revel under the roles they’re given. Winona Ryder (when was she last on TV or film?) is utterly terrific as Will’s mother Joyce, instilling great empathy into a mother who’s had to endure the hardship of bringing up her kids as a single mother due to a troubled divorce, and is now teetering on the brink of sanity as she desperately tries to convince anyone that her youngest son is still alive. As for her oldest, Charlie Heaton puts in a great effort to make Jonathan’s transformation from socially awkward, naively creepy photography enthusiast to unflinching monster hunter both welcomed and believable. And while it’s an exercise in character development that 80s horror practically invented, Nancy’s journey toward the exact same destination from her initial place as mildly vapid high school cliquester is just as well-rounded, thanks to Natalia Dyer. 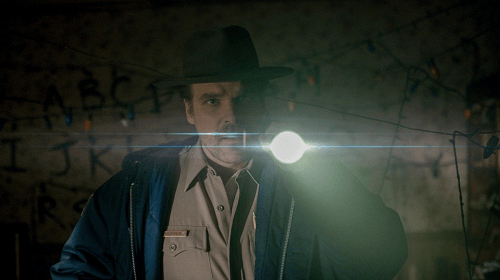 David Harbour also deserves massive kudos for his strong showing as Chief Hopper - his growing obsession with Will’s disappearance, and who exactly is responsible for it, is as riveting as any old-school detective yarn is likely to serve up. But last - and certainly by all means most - it is the more junior cast who drive home the franchise as ultimately excellent viewing. As El, Millie Bobby Brown is probably the pick of the kids, managing to convey both her character’s desperate fugitivity and inner torment with painfully convincing emotion - and also with only a handful of spoken lines to get her by. But the others that her character befriends definitely shouldn’t go without mention - the determination and leadership of Mike, the goofball one-liners of Dustin and the guardedness of Lucas towards their new para-psychic friend all come with their own surprising levels of emotional depth for such young performers. In a similar way that 1986 drama film Stand By Me propelled the careers of a number of child actors, don’t be surprised if you also hear the respective names of Finn Wolfhard, Gaten Matarazzo and Caleb McLaughlin pop up in features to come. Given their collective level of innate talent, it’ll be practically impossible for them not to. 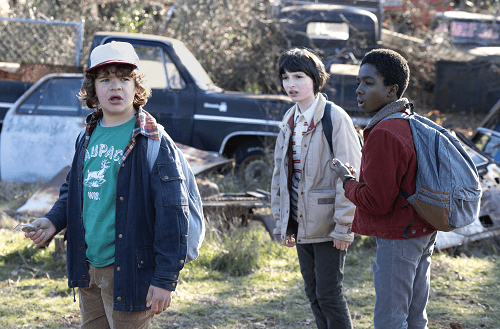 It is, above everything else, the strong cast performances and a dabble of awesome set-pieces (one pursuit involving the kids fleeing a horde of Hawkins Lab vans by bike is especially exciting) that keep the bar high for Stranger Things. They definitely have to, in the midst of its writing threatening to lose itself in overt pandering to a past that wasn’t quite as great as the show touts it to be. But when it does take its 80s horror seriously - and it does so very consistently - Stranger Things is utterly compelling, and perhaps does deserve the near-religious fandom it has already generated for itself. Even if the days of Freddie Kreuger are long gone, and even if you never cared for those days in the first place, this is one horror-thriller series more than able to keep present-day audiences on the edge of their seat by using the scares of yore. That in itself is an achievement - a feat that makes Stranger Things worthy of experiencing, and continuing into a much-anticipated Series Two. Stranger Things is currently available for streaming on Netflix.